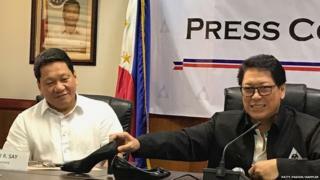 Philippines Labor Secretary, Silvestre Bello III, don sign order on Friday, August 25, after labor union protest the dress code wey dem talk say carry plenty risk for women wey dey work. The Associated Labor Union (ALU), wey dey represent around 400,000 workers for di country, say di new regulation include sales ladies for supermarkets, waitresses, receptionists for hotels, and flight attendants. Dis happen after labour union protest say di shoe dey tire women to wear, like di ones wey dey work for store and big shopping complex because to dey waka up and down or stand for many hours dey painful. Apart from di pain, working women also dey complain say dem fit wound if dem fall down sake of say dem wear high heel. "Nobody go fit tell women say make dem wear high heels again," according to Under Secretary Department of Labor and Employment (DOLE), Dominador Say. "We dey talk shoe wey high pass one inch. We go still allow one inch but e go need to be wedge-type, no be stilleto," Say also talk. Di department also tell companies say make dem dey give "sitting breaks" - na im be time to siddon - to both male and female workers, and to provide di seat wey dem go use. "Dem fit siddon for small time as long as e no affect di main work dem suppose do" said Say. Di sitting break order na to all industries. Di new order go take effect after 15 days. Last March, 152,420 people for United Kingdom sign petition for internet say make government stop companies to dey ask women to wear high heels but di government reject di petition. Dia reason be say, dem no need to change legislation because of am. Meanwhile, di government of British Columbia, Canada, don tell women say dem dey free to wear flat shoes go work.